Council of Nine first appeared on the dark ambient scene with Tomb of Empires, the collaborative compilation between four artists using the theme of fallen civilizations as the basis. Since then he has released three full-length albums on Cryo Chamber as well as a follow-up collaboration in Tomb of Seers, and we also cannot forget about the massive Locus Arcadia album, which was the first time that Simon Heath allowed his Sabled Sun cycle to expand outside of his own work and into the hands of his label-mates. On each of these releases Council of Nine has shown us his adaptability, attention to subtlety and his evolution as an artist. Trinity will follow most closely to Diagnosis, his last full length album. Diagnosis seemed, as its name would imply, to be the realization that there was a problem with his mother’s health. It was a look inside his mind as this news had its chance to sink in, and the artist had a chance to unload some of his emotional baggage into his music. Trinity moves forward in that narrative to the final period of her life. As the man behind Council of Nine attempts to cope with what is likely the greatest emotional roller coaster of his existence, the physical world moves forward, and the earlier diagnosis manifests itself in the physical form, bringing a demise to one life and a brush with the edges of sanity to the other. So we can see that the narrative of this album is probably one of the most fitting imaginable for the inspiration of a dark ambient album. It is also quite unusual in terms of the common narratives covered in this genre. So often artists prefer to tell an abstract story, something of horror or science fiction or the occult. Actually diving into such a personal landscape of events must be a heart-wrenching experience for the artist, and thus it is often pushed aside in favor of more palatable and superficial topics. The “darkness” in Trinity is overwhelming. It is crushing in its execution. On “January 3rd” we are confronted by actual recordings of his mother’s voice. She is literally present within the album. This must make the listening experience for the artist all the more emotional. 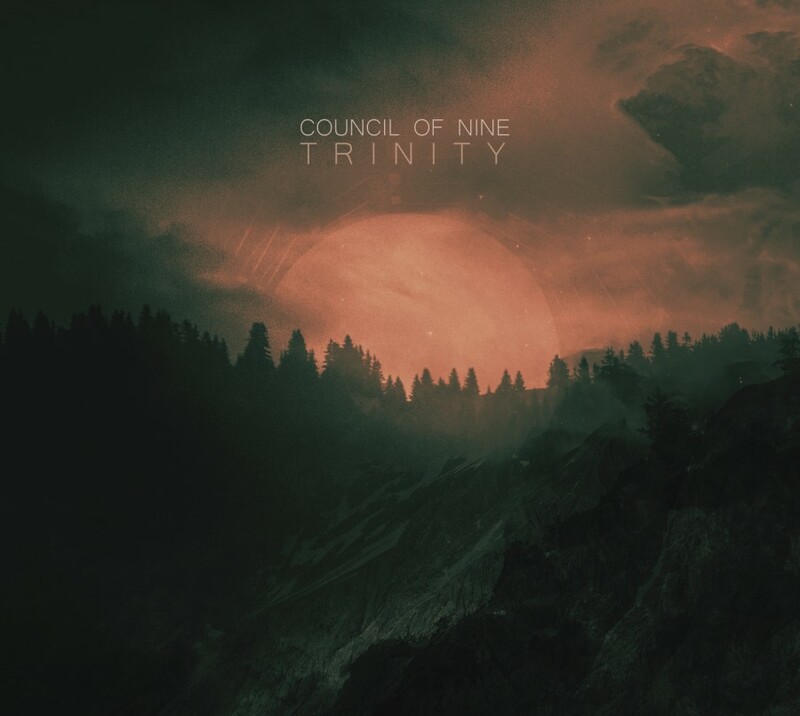 While there is a hopeful beauty to some of the songs by Council of Nine, particularly those on Tomb of Seers, we hear none of that side of the artist manifest itself on Trinity. Council of Nine downplays the crushing bass drones on this one. He allows the lighter elements of his sound to come to the forefront, without actually allowing the mood of the tracks to be uplifting. These kinds of things allow the overwhelmingly somber subject matter of the album to expose itself fully without becoming overbearing on the listener. The subtlety and nuance on Trinity is only possible for an artist that has been fine-tuning his craft nonstop over the last few years. Council of Nine has had little downtime since his first appearance on Tomb of Empires. He has become a master at pulling the emotions of the listener in any direction he chooses, all the while delivering top-notch musical output. Trinity is obviously the last part of a three album sequence. It is a closure to everything that Council of Nine has done within his three solo releases. This leaves a big question mark for listeners as to what will come next. Trinity being the most personal of these three releases it seems quite possible that we will now move into some territory that is much less connected to the artist’s personal life and more aligned with his external interests. Trinity can be seen as the closure to his period as a new artist. What comes next will come from a musician that has honed their skills for several years, and is prepared to deliver their craft with a purpose and mastery that can only come from a veteran artist. For now we have plenty of great Council of Nine music to keep us entertained, and we can patiently wait to see where this artist will direct his attention next.